Quick update regarding Mad Devils! Mad Devils started production in March of this year and we’re currently hard at work on the title with a scheduled end to production in March 2019 for a Spring/Summer 2019 launch on PC and PS4. Our fantastic writer, Clay Murphy has unfortunately (for us) moved on to Remedy and was replaced by Greg Buchanan who was recently named to a list of top talent in the UK by GameIndustry.Biz who’s previous credits include No Man’s Sky – Atlas Rises and Aquanox: Deep Descent. With help from the Canadian Media Fund we were able to expand our team and our new team members are working out great! 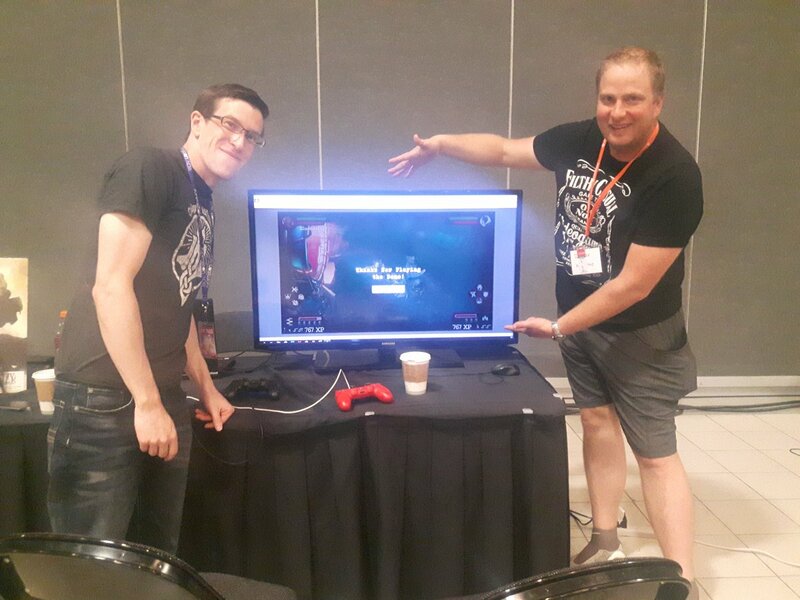 Two players pose at Animethon after defeating our demo level! 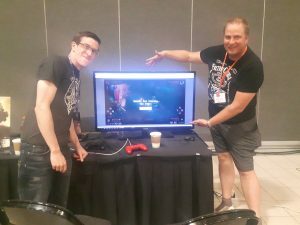 We just finished showing of Mad Devils to the crowd at Animethon 2018 here in Edmonton and were overwhelmed by the positive feedback and support we received. While things move forward on Mad Devils we’re also working on a project we’re not yet able to talk about, but hopefully we’ll be able to announce the title in the coming months. In the meantime, we’ll be attending Gamescom 2018 in Germany, Busan Indie Connect in South Korea and the Tokyo Game Show in Aug/Sept as we look to continue to expand our studio and partner with other great companies and publishers in the industry! Keep watching for more updates as Mad Devils nears completion!